Follow Bonnie Prince Charlie's journey to raise a Jacobite rebellion and reclaim the British throne for his father, James Stuart. Investigate an early steam engine, "The Rocket" designed by George Stephenson. Explore the industrial inventions and developments pioneered in the West Midlands in the 18th and 19th centuries. Meet the engineer James Watt and the scientist Joseph Priestley and find out more about their contributions with online activities. Captain James Cook, his life and historic voyages. Follow an animated map of the Battle of Trafalgar, 1805. Examine a portrait of George Washington. Explore the causes and consequences of the American Revolution. Test your knowledge of the American Revolution and navigate your way to independence. Take a photo tour of Houghton Hall, the stately home of Robert Walpole, the first Prime Minister. Listen to poems by Blake, Byron, Wordsworth, Coleridge and other Romantic poets. Read a brief biography of John Constable, and see some of his most famous paintings. Walk through a Georgian house or watch movies about life for a wealthy family in Georgian Edinburgh. Read the story of the United Kingdom and the Union Jack flag. View a timeline of key events in Georgian Britain. From the elegance of stately homes, to the squalor of the slums, this book tells the story of life in Georgian Britain. Includes links to websites to find out more information via the Usborne Quicklinks Website as well as lists of places to visit throughout Britain. 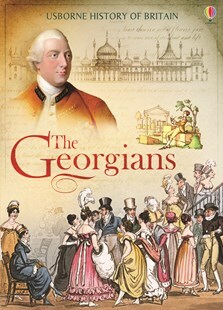 From the elegance of stately homes, to the squalor of the slums, this book tells the story of life in Georgian Britain. Full of intriguing facts, illustrations, photographs, detailed reconstructions, paintings, maps and timelines. Includes links to websites to find out more information via the Usborne Quicklinks Website as well as lists of places to visit throughout Britain.